Top: Robert Beardsley (left) shows media guests Ruthmere's stained glass second-floor skylight from the top. 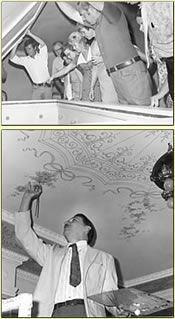 Bottom: Artist Paul Szabady restores the decorative painting on the ceiling of A. R. Beardsley's bedroom, c. 1972. In 1910, Elkhart, Indiana, was a town of 21,365 residents that covered six square miles. It had ten public schools, the telephone had arrived, and the automobile age had begun. Albert R. and Elizabeth Baldwin Beardsley commissioned Chicago-trained architect E. Hill Turnock to design and build Ruthmere in 1908. For 14 years, Ruthmere was a place where they entertained friends and business associates in grand style. Elizabeth and Albert both died within a few short months of each other in 1924. Albert's nephew, Arthur Beardsley and his wife Stella lived at Ruthmere until Stella's death in 1940 and Arthur's death in 1944. The Sherill and Helen Deputy family moved into Ruthmere in 1945, raising six boys in the house--the first and only children to ever call Ruthmere home. In 1969, the Deputys sold Ruthmere to the Beardsley Foundation, which restored the home to its former glory, with the express purpose of creating a museum for the community and the region. Albert's great-great nephew, Robert Buchanan Beardsley, an architectural preservationist, supervised the restoration, which began in 1969. The site opened to the public in 1973 with Robert Beardsley as Director, and was placed on the National Register of Historic Places in 1978. 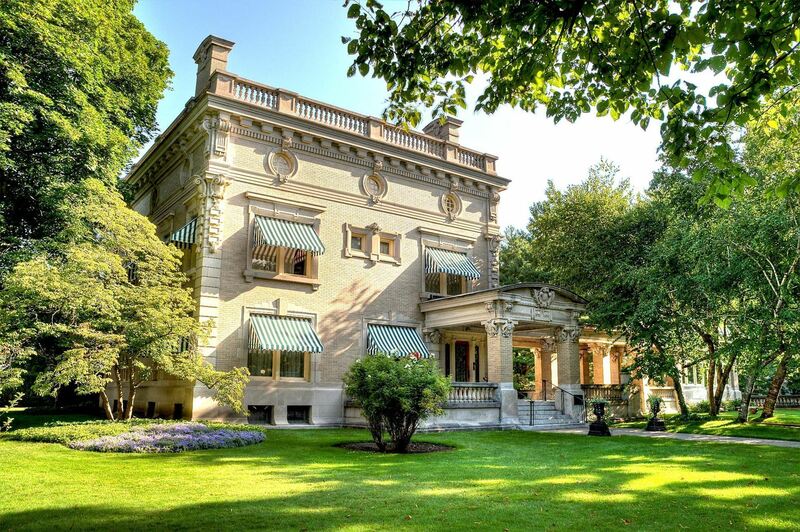 Today, Ruthmere is a multifaceted cultural and historical museum home, offering visitors a glimpse into the lives of a wealthy, innovative man and his engaging wife, as well as rich exposure to architecture and art. In addition to offering regular tours, Ruthmere hosts numerous special events, including concerts, garden parties and special exhibits, as well as weddings and other private affairs. Ruthmere is a true piece of Americana. Visit us soon.